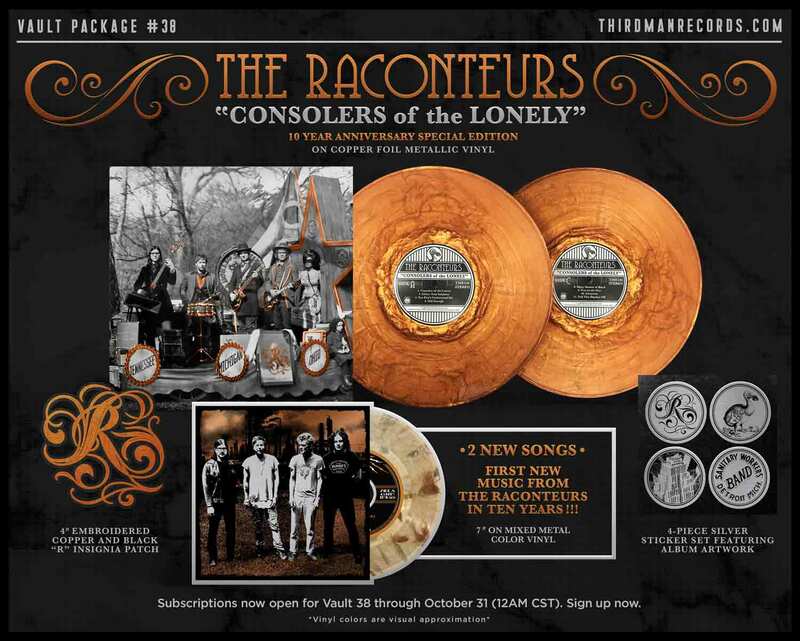 To celebrate ten years since the release of The Raconteurs’ Consolers of the Lonely, Third Man Records is reissuing the noteworthy album as part of Vault Package #38. Pressed on copper foil vinyl, this is the first time the double LP has ever been made available on colored vinyl. Coupled with a slightly re-imagined front cover highlighting new metallic accents to the iconic tintype image, this release was mastered directly from the original 1” master tapes and pressed at Third Man Pressing in Detroit, Michigan. The 7″ in Vault Package #38 feautures the first NEW songs in ten years from recent sessions that will ultimately result in a new Raconteurs album in 2019. This very special Vault will also include a 4″x4″ Copper and Black “R” Insignia embroidered patch for your rocker jean jacket and a set of four 2.5″ Brushed Silver stickers featuring art from Consolers of the Lonely.